Di Morelli Retinol Serum is an advanced anti-aging formula containing Retinol, Vitamin C and Co-enzyme Q10. This serum can be used on a nightly basis to promote youthful, radiant skin. Improves wrinkles and texture, stimulates collagen, and lightens hyper-pigmentation (brown spots). Limit use to twice a week, gradually increase frequency to every night or as tolerated. 1. Apply sparingly and evenly in the evening to face and neck, avoid the eye area. 2. Use sun protection and limit sun exposure while using this product. *Do not use if you are pregnant, lactating or if your are planning to become pregnant. A form of Vitamin A that is converted to retinoic acid in the skin. Stimulates collagen and elastine to minimize the appearance of fine lines and wrinkles. Increases cell turnover, smoothes texture and evens skin tone. A stable, water-soluble derivative of ascorbic acid. Also known as coenzyme Q10 (Co Q10), it is a vitamin like, fat-soluble substance present in all human cells. Is an active plant extract derived from German Chamomile. Di Morelli Retinol Serum was formulated based on the common desire for younger looking skin. We wanted something that could be used in a daily regime without the harsh side effects of most retinol serums on the market. 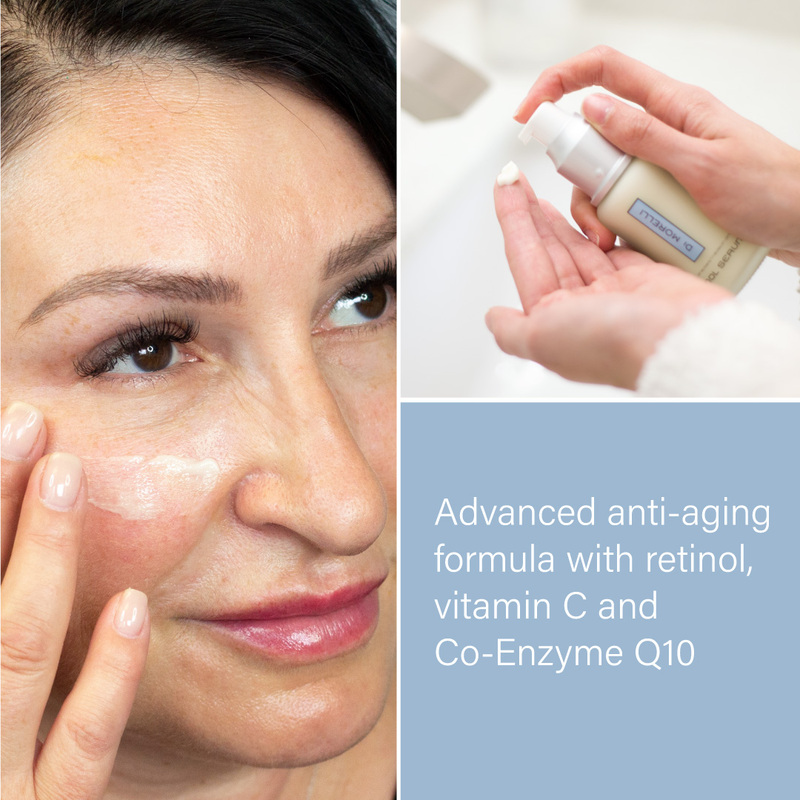 We combined Retinol, Vitamin C and antioxidant Coenzyme Q10 to provide a product that reduces the appearance of fine lines, wrinkles and hyperpigmentation, while providing additional skin protection from free radicals by antioxidants.